The Angriest: Star Trek: The Next Generation: "Suspicions"
It is 10 May 1993, and time for another episode of Star Trek: The Next Generation. Dr Crusher (Gates McFadden) has been relieved of her duties as ship's chief medical officer, and awaits transportation to a court martial for disobeying a direct order. In conversation with Guinan (Whoopi Goldberg) she relates how she attempted to set up a small scientific conference only to have it end in a murder, a suicide, and the end of her Starfleet career. Poor Gates McFadden. She does not get episodes dedicated to her character very often - certainly a lot less often than male counterparts like Jonathan Frakes and Brent Spider - and when she does get them they are almost invariably terrible. Her losing streak does not break with "Suspicions", a laboured and trite murder-mystery in which the killer is obvious and the flashback-based verbal narrative grates constantly on the nerves. Crusher has brought together a group of scientists - a Klingon, a Vulcan, a human, and a new alien whose mysterious physiology cannot be understood or studied - to witness a demonstration of Ferengi scientist Dr Reyga's metaphasic shields, that will enable shuttles and small spacecraft to enter the coronas of stars to undertake scientific research. It is actually a rather neat idea to have a Ferengi scientist, since by his own admission science isn't really something for which Ferengi are widely regarded. The assembled scientists are skeptical of Reyga's claims, but agree to undertake a test flight. Jo'Brill, that alien whose mysterious physiology cannot be understood or studied, volunteers to pilot a shuttle under the new shields into a nearby star. Let us pause momentarily because one really has to ask why, on a starship containing dozens of engineers and scientists, it is the chief medical officer that is organising a small conference on energy shields, and not say the chief engineer or science officer. It genuinely makes no sense, and puts the episode on a bad footing - a footing already pretty shaky by the tedious narration by Crusher as she interminably explains why she's just been fired. The test goes wrong, the shield appear to momentarily fail, and Jo'Brill - that guy who (you get it) - mysteriously dies without cause. Soon afterwards Reyga has committed suicide, except Crusher suspects foul play. In the course of her dogged murder investigation she ignores a direct order and undertakes an autopsy on Reyga's body - an autopsy his family has specifically forbidden on religious grounds. Despite being fired over her choice - and correctly so - she is encouraged by Guinan to continue investigating and, while impulsively undertaking a fresh test of the shields herself, is ambushed by the not-dead-at-all Jo'Brill - the very same scientist whose identity as the killer was obvious even before anybody died. This really is the most insultingly stupid mystery. The real mystery is why the episode is so bad. Its writers, Joe Menosky and Naren Shankar, are fairly talented guys. Menosky co-wrote "Darmok", one of my favourite Next Generation episodes ever. I am guessing that, as Season 6 headed towards the finish line, there simply were not enough scripts ready on time and this one was knocked out over a weekend. What is worse, this is Guinan's last-ever episode of Star Trek: The Next Generation. Whoopi Goldberg's schedule simply didn't accommodate a Season 7 appearance. It's a hell of a thing on which to bow out. 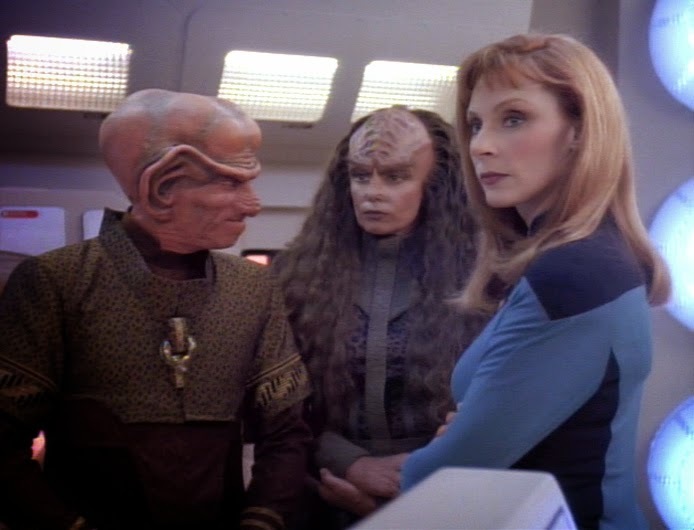 At the episode's end Dr Crusher is reinstated as ship's CMO and every goes about their day. Except for Reyga's family, I assume, who are probably still waiting to hear back about the complaint they made at the Federation Embassy. Humans, eh? Racist towards Ferengi until the very end. We are 22 episodes into Season 6, and 14 episodes have been good. I cannot emphasise how much this episode is not one of the good ones. The quality ratio slips back to 64 per cent.